warn from a previous session providing limited traction so you know you’re going to need to change your driving style for this race or at worst change kart. It’s more important to get heat in the tires near the end of the instruction lap rather than at the beginning but make sure you’re in a position that when you are waved on to race you have the momentum and position on the track to get a perfect start. 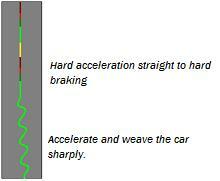 For example you don’t want to be swerving left and right to heat your tires up as the race starts and all the other competitors fly straight past you. The key to getting a good start is confidence and self-assurance. The biggest problem for drivers at the start of a race is that they get a sensory overload. There is just way too much going on around them to be able to make the right move at the right time but whatever happens you have to go first. You have to accelerate before the driver ahead of you. Now, you might say that it’s too risky to do that because you will hit him…..But, you won’t hit him if you stick to his bumper so close that there is never any space between you! So if you push him gently over the line that’s fine, at least he didn’t get away. So, if you are always so close to the driver in front that you are touching, then you will be able to hit the gas before him without the worry that you will whack him up the arse and crash! And once you get over the line you are into your plan. Make the moves, make that perfect first lap happen.